We recently saw the best price ever on your favorite Bluetooth speaker, the Anker SoundCore- $24, as well as the best price ever on Anker’s step-up speaker options- $40, over on Kinja Deals. 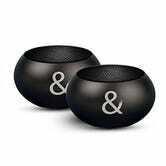 That same forty bucks will get you a pair of ultra-portable surround speakers from Kempler & Strauss. The X2 Surround Sound Bluetooth Speakers were a random find at CES this year, and when I saw them I was expecting a far bigger price tag. The X2s include both a double-headed micro-USB cable and a magnetic charging dock for... charging. That’s good, because battery life is absolutely the big sacrifice here- four hours of playtime (eight if you use them one at a time!). Of course, that’s not much of a fair comparison given each X2 speaker is multiple times smaller and lighter than most Bluetooth speakers. How do they sound? Great for forty bucks, and they’re in actual stereo. If you typically travel with a Bluetooth speaker so you’re not stuck with the bad audio from your laptop or iPhone speakers, the X2s are absolutely worth a look for their impulse price, actual stereo, and saved space.